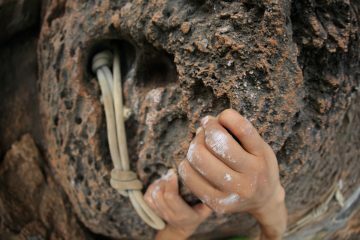 Have you tried all the tips you can think of to become a better climber and are ready to add training to your routine? 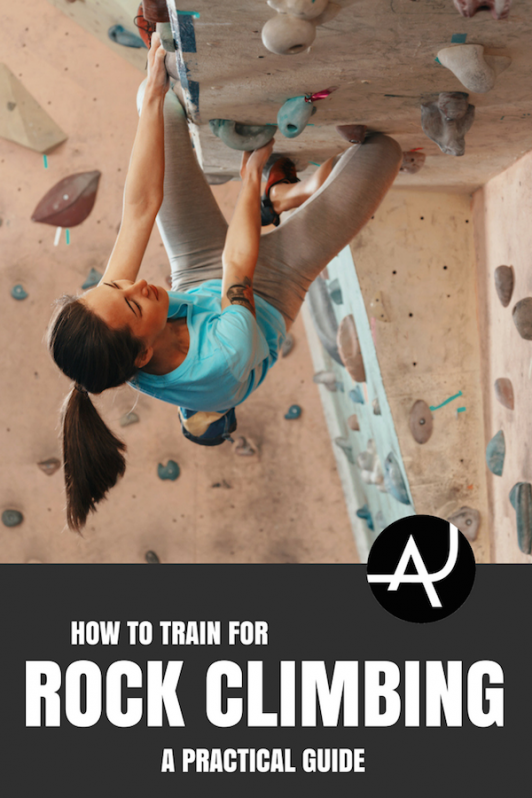 Figuring out how to train for rock climbing can be daunting. Knowledge on climbing has been expanding over the past fifteen years and we are now in an exciting era of training for this sport. There is no one best way to train. You need to know your body, identify strengths and weaknesses, and be honest with yourself about goals and motivations. As an added complication, many experts differ on their opinions of how to train. To help you out, we at The Adventure Junkies have curated the most well-accepted training methods to get you on your way. A common mistake that climbers make is over-training. Over-training can lead to injuries, particularly in the fingers, elbows, and shoulders. One way to prevent over-training is to design your schedule around an anticipated peak, such as time off in the summer or an upcoming climbing trip. Using a linear periodization is a great way to develop a training schedule, especially for beginners. It’s important to lay out your goals to plan how best to meet them. Having concrete goals will help you to choose the length of cycles in your training plan. Identifying weaknesses can be extremely beneficial as well as that will help to target your training. There are many great trainers and resources online that can help you to train effectively. Training Beta provides training programs for all sorts of climbers, and they are dedicated to assembling knowledge from experts in the field. Finally, ensure that your training schedule incorporates lots of time for rest and recovery. To prepare your body for any training workout you must first warm-up. Start with 10-15 minutes of light cardio to get the blood pumping. Follow your cardio workout with dynamic stretching. Finish your warm-up with at least 60 moves of easy climbing. If you are training at home or don’t have access to climbing terrain, you can modify the climbing-specific warm-up. Taking care of your body is a crucial component of climbing and training for climbing. It is important to ensure that your opposition muscles receive attention to remain strong and prevent muscle imbalances. 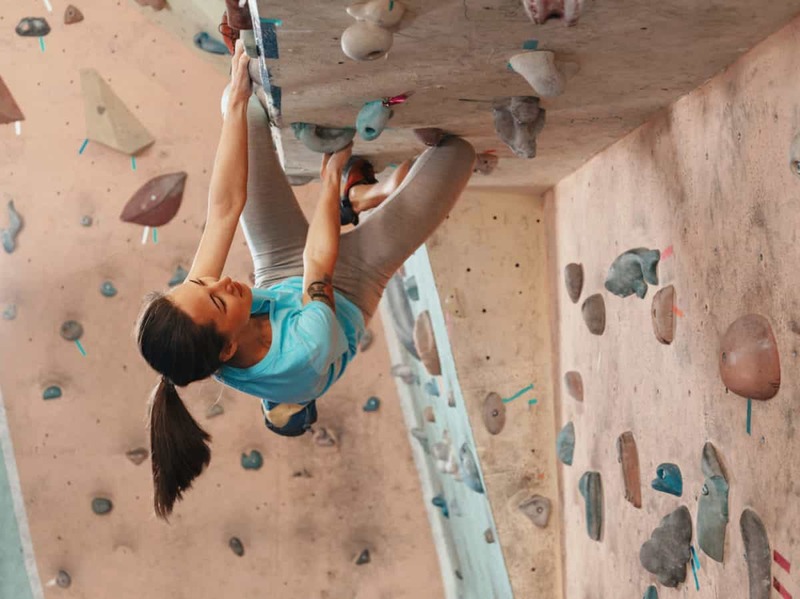 Climbers can improve muscular balance by strengthening their shoulders and scapular region, leading to less strain on connective tissues and reduced instances of injury. There is no substitute for time spent climbing. It is well-accepted that one of the best ways for new climbers to improve is to spend more time climbing. While training will definitely provide gains in strength, power, and power endurance, building baseline endurance in conjunction with good technique will make you a better climber. Besides, climbing is what you fell in love with, so don’t lose sight of that by spiralling too far into the world of training. One of the keys to training is to shock the body by transitioning to new exercises, or phases of exercises, after a period of time. To eliminate the plateau that a body experiences after four to six weeks, climbers often apply periodization to their training. There are four main physical training phases: Endurance, strength, power and power endurance. A great way to put together your training schedule is through periodization. While we recommend a linear periodization program for beginners, non-sequential periodization training that may be more effective for intermediate and advanced climbers. When you first start climbing you may find it hard to have a long session because of a burning sensation, known as “pump”, in your forearms. By building up your base endurance, you will improve your fitness and establish the foundation on which to build the next phases of your training. Endurance training is aerobic, as your muscles are using oxygen to complete repeated moves. There are lots of tips on how to train for endurance, but usually they involve a high volume of moves at relatively low difficulty. 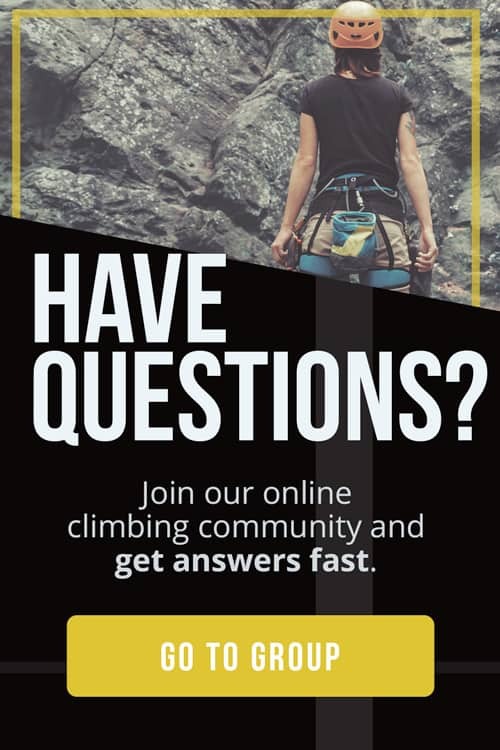 Your endurance training phase is a great time to focus on practicing climbing technique! 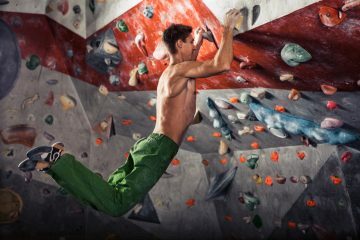 There are multiple ways to train muscular strength for climbing. Recently, the training community has recognized the advantage of supplementing your strength workouts with functional weight training. Hangboarding is another popular isometric training technique that is often used to target finger strength. By hangboarding you are training your body to recruit muscles fibers more effectively while strengthening critical connective tissue. There are two general strategies that climbers use for hangboarding: repeater style exercises and max hangs. A repeater style hangboard workout aims to mimic the time you spend on a hold while climbing a route. Typically hangs are 5-7 seconds long with 3 second rests in between. A variety of hold types can be used in these workouts. This method was popularized by the Anderson Brothers. For max hangs, you determine the maximum amount of weight you can add to your body to hang for 10 seconds on a large (18-20mm) edge. Hangs are done with hands in a half-crimp or open hand position, with long rests between only 3-4 reps. The benefits of max hangs are supported by research done by Eva Lopez, and one great tool for this type of training is the Transgression Board. Power can be defined as force over time. Strength is required to produce a force, and when this happens quickly you have power. In climbing, the term power is usually used to describe moves that are dynamic in nature, common in bouldering or climbing in steep terrain. There are many methods that climbers use to build power. “Limit bouldering” involves attempting to do moves at or above your physical limits. Usually between one and three moves are attempted in sequence, and any set of moves may repeated multiple times. Some tools have been developed to help climbers execute super hard moves on steep terrain. 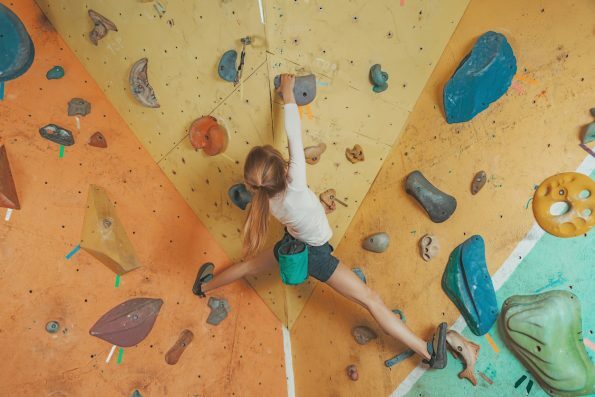 A systems wall is a board with holds set in mirror image of each other on either side of the center line, allowing the climber to recreate exact positions and movements for both sides of the body. The ideal angle of a systems wall is between 20 and 35 degrees, but many boards are adjustable so that the climber can choose their desired angle of steepness. The moon board is 40 degree overhung with a defined set of holds that allow climbers to set boulder problems and then share them with the greater climbing community online. In order for a moon board to be beneficial, you should first be climbing at a minimum V5/6 level. Another strategy climbers often use to build power is campusing. 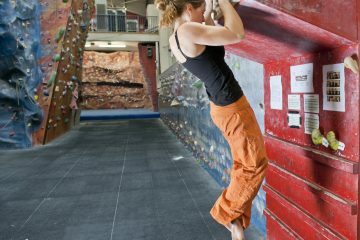 Many climbing gyms have campus boards available for their clientele. Campusing is an advanced technique that can be extremely stressful on the body, but it is very effective. Strength endurance training, commonly called power endurance, blends strength, power and endurance together, enabling the climber to execute many difficult moves in a row despite feeling pumped. Strength endurance trains the anaerobic system, which kicks in after the body has used up oxygen to the muscles. One way to train for strength endurance is using 4x4s. Choose four boulder problems near your flash level and climb them all back to back without rest. Wait for at least five minutes and then repeat the boulder problems three more times for a total of four rounds. For best results, choose boulder problems in steep terrain. Interval training is another effective training method for strength endurance. On an overhanging wall, climb continuously for one minute and then rest for one minute. Repeat the exercise with two minute intervals, then three minute intervals, and then work back down to one minute. Repeat as desired. A third method of working strength endurance is by climbing hard routes. Pick a route just below your flash/onsight level and try to climb it three times back to back without resting. Routes on steep terrain are best. 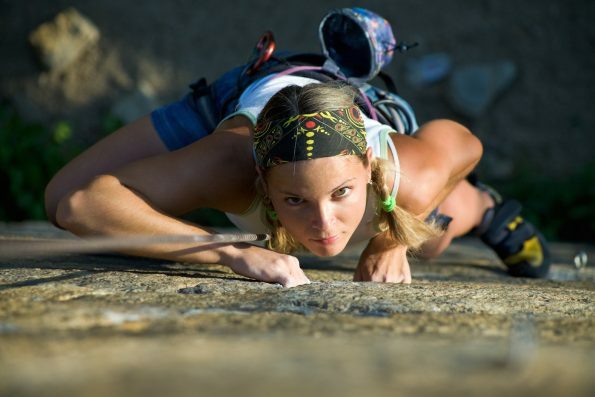 Many climbers believe that mental ability is nearly as important as physical ability. Fear is a very real emotion that climbers often experience and must learn to manage. 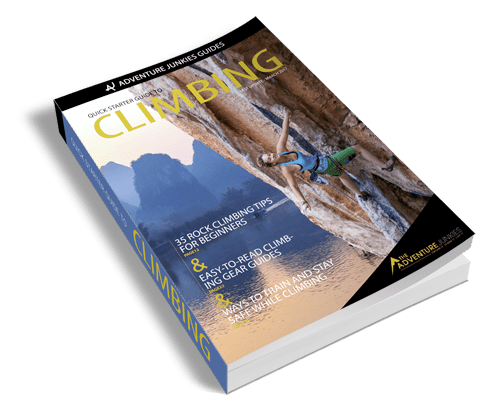 The Rock Warrior’s Way is a great resource for any climber looking to strengthen their head game. Climbers must also learn the role of their ego in success and failure, and how to engage laser sharp focus when trying to send.